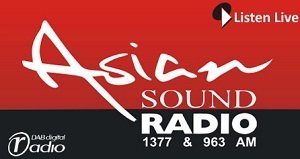 Asian Sound Radio Hindi FM Live Streaming Online . Listen more than 80 Hindi FM Radio Stations Online . Enjoy Live Streaming Hindi Music 24 by 7. The only 24 hour radio station in the North dedicated to the Asian community, broadcasting across the whole region from Preston in the North to Stockport in the South. The programming is a blend of news, interviews, competitions, music and information in English, Urdu, Punjabi, Bengali and Gujarati.